When I started collecting, I bought into the popular opinion that Jimmy Smith isn’t “collectible” and didn’t pay him any attention. But then I found this great 1965 German documentary on him serving as evidence of how “incredible” he really was. From the live performances where he plays with so much heart and frankly, tears it up, to the interview moments where he communicates his philosophy of jazz and music in general so well, I decided to start listening. So I made a Spotify playlist of all his Blue Note albums, put it on shuffle while I worked, and a couple weeks later I had a condensed playlist of favorites (you can hear that playlist on Spotify now). One of those songs, “Groovy Date”, is from this LP. The sheer power with which the song opens and closes was enough to make me hit the “heart” button, and the solos from all the members do not disappoint. Despite this album being available only in mono regardless of format, many Smith Blue Notes are only available in stereo as reissues. So I decided it would be both worthwhile and cost-effective to pursue these albums in their original mono LP incarnations. Since Smith originals are so readily available, I quickly acquired six of them. This one was a little harder to get online, but then one day I was in a local shop and they had this copy for cheap. The cover looked great but the vinyl was pretty marked up. It doesn’t play with any skips, and aside from “Groovy Date”, it can be a little noisy. That’s fine with me because my favorite track sounds bold and clear, and I basically chalk this up as paying a fair price for a single song and a great cover (I love the photos of the musicians, the layout, and the color scheme). As for one of my favorite topics, sonics, this is one of a handful of Blue Note albums recorded by Rudy Van Gelder that wasn’t recorded at one of his studios or a live venue. For years I noticed the recording location “Manhattan Towers” for various Blue Note recordings on jazzdisco.org but never knew what it meant. But then, one day I was lucky enough to speak with Blue Note producer and archivist Michael Cuscuna about it, and he explained that Blue Note had worked out a deal with Manhattan Towers, a hotel in New York City’s Upper West Side, so bigger bands could assemble in their ballroom (Art Blakey’s percussion ensembles, Sabu Martinez) and important artists like Smith who liked to record at night could jam after the normal Hackensack business hours (Van Gelder’s neighbors were known to complain about the noise late at night and his parents lived there). In writing this article I did a little research and found this cool New York Times article from 1974 explaining that the hotel, located on Broadway between West 76th and 77th Streets, was crime-ridden! (One has to wonder if it was similar or becoming more that way in 1957!) You can hear the massive size of that ballroom on these cuts. The horns, organ, and guitar still sound quite immediate and up-close, but the reverberation of Art Blakey’s drums is true to the space’s larger size. 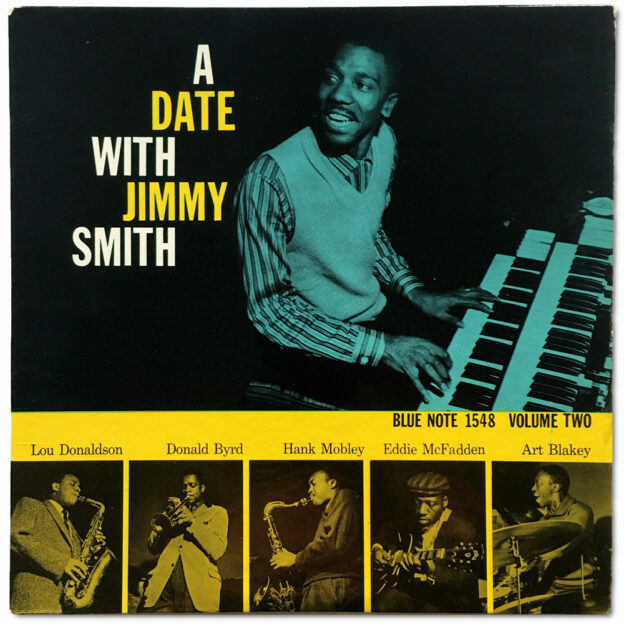 Stay tuned as I review more of Jimmy Smith’s classic Blue Note recordings in the coming months.